I managed to get my first container up and running in the cloud today (yeah! 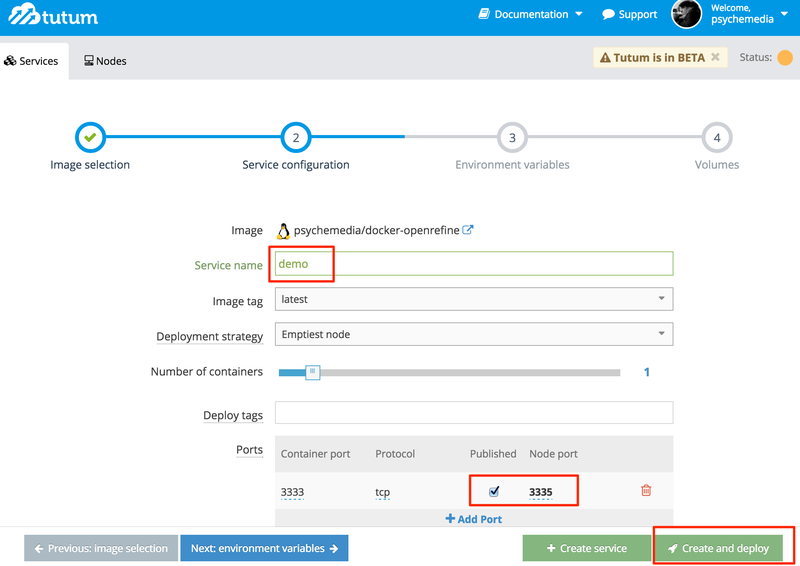 :-), using tutum to launch a container I’d defined on Dockerhub and run it on a linked DigitalOcean server (or as they call them, “droplet”). This sort of thing is probably a “so what?” to many devs, or even folk who do the self-hosting thing, where for example you can launch your own web applications using CPanel, setting up your own WordPress site, perhaps, or an online database. 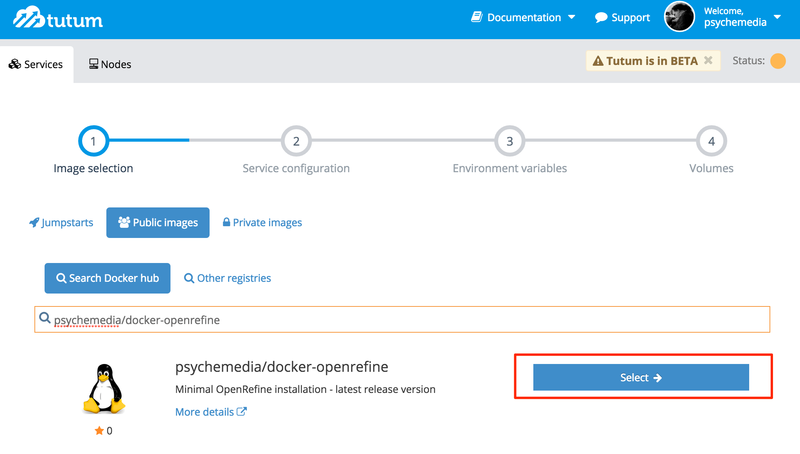 I’d already published a container on dockerhub that launches the latest release version of OpenRefine: psychemedia/docker-openrefine. This lets me run OpenRefine in a boot2docker virtual machine running on my own desktop and access it through a browser on the same computer. I’m going to start by launching a 2GB machine which comes in a 3 cents an hour, capped at $20 a month. We need to do a tiny bit of configuration. Specifically, all I need to do is ensure that I make the port public so I can connect to it; by default, it will be assigned to a random port in a particular range on the publicly viewable service. I can also set the service name, but for now I’ll leave the default. The first time I pull the container into a specific machine it takes a little time to set up as the container files are imported into the machine. If I create another container using the same image (another OpenRefine instance, for example), it should start really quickly because all the required files have already been loaded into the node. 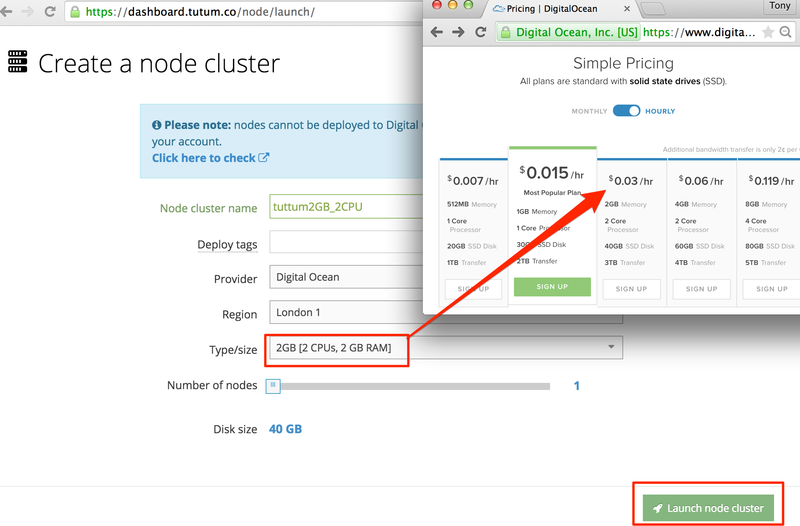 The billing is calculated on DigitalOcean on a hourly rate, based on the number and size of servers running. To stop racking up charges, you can terminate the server/droplet (so you also lose the containers). 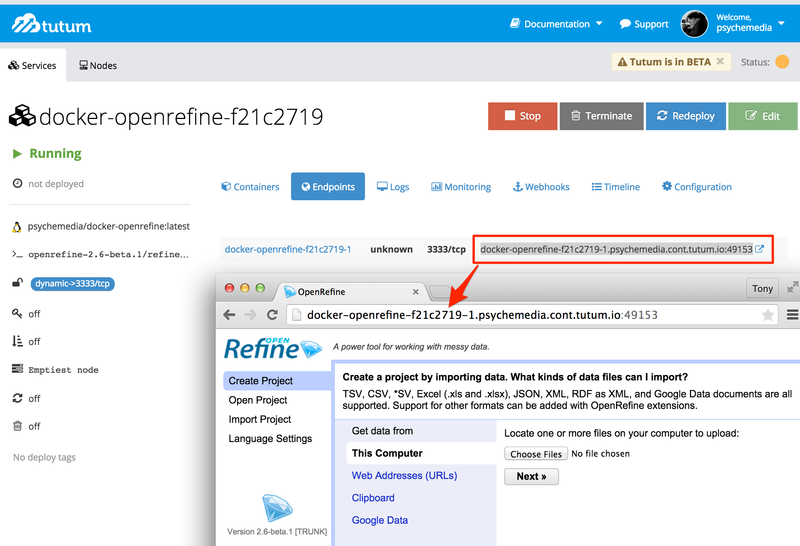 Note than in the case of OpenRefine, we could allow several users all to access the same OpenRefine container (the same URL) and just run different projects within them. One thing I haven’t explored yet is mounting data containers/volumes to link to application containers. This makes sense in a data teaching context because it cuts down on bandwidth. If folk are going to work on the same 1GB file, it makes sense to just load it in to the virtual machine once, then let all the containers synch from that local copy, rather than each container having to download its own copy of the file. The advantage of the approach described in the walkthrough above over “pre-configured” self-hosting solutions is the extensibility of the range of applications available to me. If I can find – or create – a Dockerfile that will configure a container to run a particular application, I can test it on my local machine (using boot2docker, for example) and then deploy a public version in the cloud, at an affordable rate, in just a couple of steps. In an institutional setting, I can easily imagine a local docker registry that hosts images for apps that are “approved” within the institution, or perhaps tagged as relevant to particular courses. I don’t know if it’s similarly possible to run your own panamax configuration registry, as opposed to pushing a public panamax template for example, but I could imagine that being useful institutionally too? 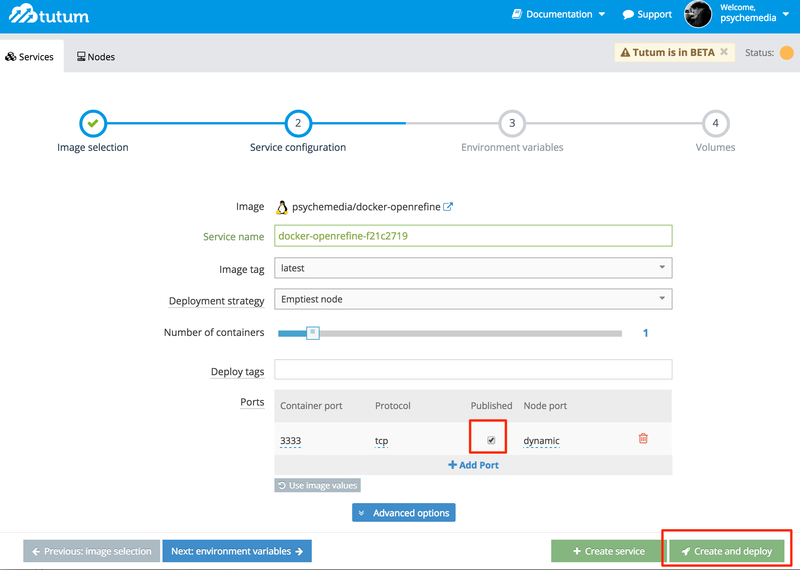 For example, I could put container images on a dockerhub style OU teaching hub or OU research hub, and container or toolchain configurations that pull from those on a panamax style course template register, or research team/project reregister? To front this, something like tutum, though with an even easier interface to allow me to fire up machines and tear them down? Previous Previous post: Whose Browser (or Phone, or Drone?!) Is It Anyway?